I’m a bit of a conflicted person. Those who know me will go “well, duh” at this, but let me elaborate anyway: I have contradictory opinions about many things. Take, for example, Google. On the surface, anyone who reads my writing regularly will conclude that I absolutely loathe Google and everything it stands for. And that’s true, to an extent. But at the same time I’ve an enormous amount of admiration and respect for Google, for what they’ve accomplished, the platforms they’ve built, the innovation they’ve provided for the world. The resulting cognitive dissonance is why I’m such an angry man so often. Another topic I’m so conflicted about is behavioural economics. This is a fascinating branch of economic theory that investigates the power of subconscious signals to influence human behaviour. On the one hand I appreciate the enormous power of marketing and advertising to influence people’s subconscious thought processes and affect their behaviour, but on the other hand such subconscious manipulation scares and abhors me. I’ve written before about the potential negatives of applied behavioural economics – known as neuromarketing – but today I want to look at the positive lessons we can learn. Specifically, one aspect of behavioural economic theory that businesses can apply to great effect: small extras that lead to big impacts. A few years ago Rory Sutherland, an advertising genius whose talks should be required viewing for everyone in our industry, gave a great TED talk about the power of small things. Some of his examples were about little salt & pepper shakers on Virgin Atlantic upper class flights, buttons in a hotel elevator that changed the music, and how vaccinations in children in 3rd world countries is encouraged though free lentils. His core message was that some of the biggest problems we face can easily be solved with small solutions that cost very little, simply by tapping in to certain aspects of human psychology. 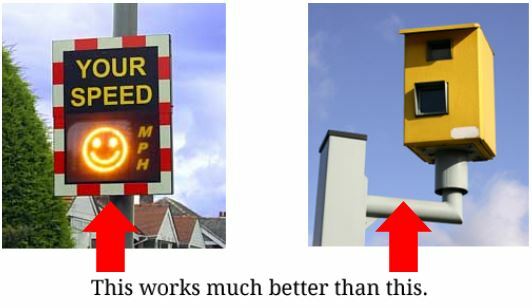 One great example is how cheap roadside speed indicators with smiley faces are much more effective at preventing speeding and accidents than expensive speed cameras, despite the fact that the latter carry a much greater risk of punishment in the form of fines and penalty points on your license. These sort of small solutions to big problems are easily transferable to the digital realm. 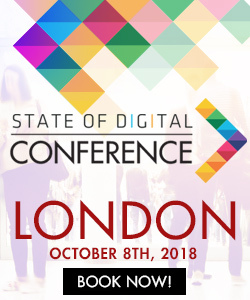 When it comes to online marketing, businesses don’t have to have massive budgets to be able to compete with the big boys; if you do lots of the small things right, you can gain a strong competitive advantage. I’ll illustrate this through a series of examples from real businesses. An old client of mine started an ecommerce site in safety gear and workwear, a fairly a competitive industry, about 7 or 8 years ago. When they first started, they gave a free pair of socks with every set of safety boots that they sold. They rarely got any comments on that, and it didn’t help them grow their business much. Then they decided to experiment and instead of free socks, they threw in a small packet of Haribo sweets with every order. Suddenly they got a lot more positive feedback, and their business really began to take off. Somehow a pair of socks has a much smaller impact as a gift than a packet of sweets (something that will surprise no one that’s ever gotten socks for Christmas). 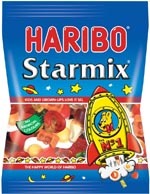 On top of that, the Haribo sweets were quite a bit cheaper than the socks. Another example of how delivery in ecommerce can make a big difference: I regularly buy stuff at Amazon (another one of those companies I feel very conflicted about). Once, a book I’d ordered just didn’t arrive. I waited for two weeks after the expected delivery date until I finally got in touch with Amazon’s customer support. And what did they do? They just sent a new book. No questions asked, no hassle, just a new shipment. It was a fairly trivial cost to Amazon, but my satisfaction as a customer was guaranteed, and because they made it such a hassle-free experience I have been a repeat customer with Amazon for years and years. One more example from a client of mine: they’re a financial services consulting business, and they make a point of checking in with all their clients at least once every two months to make sure the client is still happy, their portfolio is performing to their expectations, and to answer any questions they might have. It’s a relatively trivial cost to the business – just a few extra phonecalls really – and it makes all their clients feel valued and appreciated. Prior to the delivery process, you first need to get someone to buy from you of course. Plenty has been written about conversion optimisation, so I’m not going to delve in to that too deeply, but I do want to give one example that I see in the wild regularly which I really like: ‘no credit card required’. A little thing like that can make a huge difference to me. When I sign up for a free trial, I don’t want to hand over my credit card details. There’s a very high chance I will not become a paying customer – I reckon about 90% of the free trials I start don’t become paid subscriptions – so I don’t want to give the business my financial information. Not only am I concerned about my privacy, I’m also afraid I might be tricked in to starting a paid subscription, or that I forget to cancel the free trial before the paid subscription kicks in (something that’s increasingly likelier as I get older). By not asking me for my credit card details, a business shows a certain level of trust and generosity that alleviates such concerns, and will make me much more likely to sign up for a free trial. Lastly I want to talk a bit about emotion, specifically emotion in content. 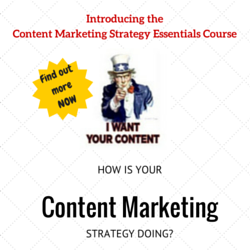 I think too many businesses play it safe when it comes to their content. Most content I read on the web that’s been generated by businesses is dull, bland, shallow, and emotionless. If your ambition is to be a part of the background noise in your industry, then great – mission accomplished. But if you want to stand out, you need to inject some emotion in to your writing. These sorts of corporate personalities trigger a lot of responses in people, from outrage and disgust to joy and wonder. Now I’m not advocating that we all become part-time comedians and think up ever more outrageous advertising stunts. But we can inject a bit of emotion in to the content we serve our audiences, and try to elicit the right kind of response from our readers. The trouble with trying to evoke a certain emotional response through written content is that often people can totally misinterpret what you are trying to do. We’ve all fallen victim to being misunderstood online, where a throwaway comment is taken the wrong way and suddenly you’ve managed to really upset someone. It’s easy to blame the other person for taking it the wrong way, but it’s really you who are to blame: communication is never about what you say, but about what other people hear. In the field of sentiment analysis there are a few academic tools that allow some rudimentary analysis of emotion in content, but I hadn’t been able to find one that goes beyond the basic positive/negative/neutral measurements. Like I said, the tool is still in private beta but you can request early access via its homepage. I hope it’ll be released to the general public soon, as I feel this tool can become a powerful new weapon in the digital marketing arsenal. The emotion analysis is very detailed and, while not perfect, will give you greater insight in to how your content can be interpreted and the kinds of emotional responses you can expect. By creating content that triggers the right emotional responses – be it joy, amazement, and surprise, or perhaps anger, annoyance, and disgust – you can set yourself apart from your competitors and stand out from the crowd in a unique way. Often when we’re faced with big challenges on a digital marketing project, we tend to look for big solutions. I hope I’ve shown that sometimes the small stuff can have big impacts, and that you don’t need massive budgets to make strong inroads. It’s more about having the courage to do things differently than everyone else, and about connecting with your customers in a way that your rivals aren’t able to. Big solutions can cost a lot of money, but as Rory Sutherland makes clear in his talk, it’s the small stuff that can really help you drive your business forward. Summer Series: Here’s our judging panel!